The tape states (c)1983, the program states (c)1984! I know I'm biased but Dave the Speccy version is HORRENDOUS. Most of the screen is occupied by clutter and unnecessary gauges and the colours are gaudy as hell. 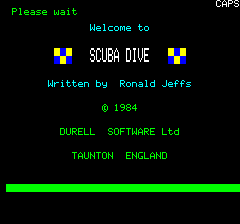 I know our scuba character looks like a comic cat but we agree on one thing: the C64 version is a joke. Not funny if you paid £6 for it back in the day though. For me, the Oric release is definitely the best. 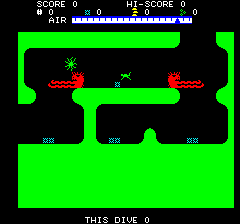 Addictive, just one more go feel to this challenging but smooth animated underwater frogger game. GET IT ON! 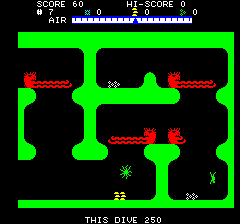 Nice game which is a little inferior to the spectrum version (which was 48k only, Oric is 16k), but VASTLY SUPERIOR to the C64 version (whoever programmed that version should be shot! and I like the C64). Very good idea and it took a lot of practise (and oxygene) to be good at it. Very nice and difficult game. I liked it very much. Most Durell Software are like this. Graphics are not quite extraordinary, but they have a small somthing in it that makes them quite addictive, even with a difficulty level that is a bit hard. I thought this version was superior to the Sinclar. Very funny game! I still love play it with my real Oric1. A must. 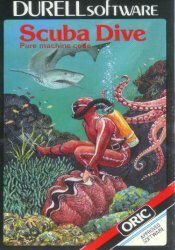 One of the first games I had and I loved it. 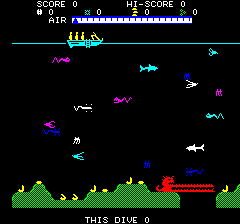 I thought the graphics on the first screen (where you have your boat and all those different types of fish) were superb. This game was really addictive - you always wanted to penetrate deeper into the cave in search of the gold and diamonds, but you had to make sure you knew where to find more oxygen cylinders! There would often be a panic-stricken dash against the clock to find some.